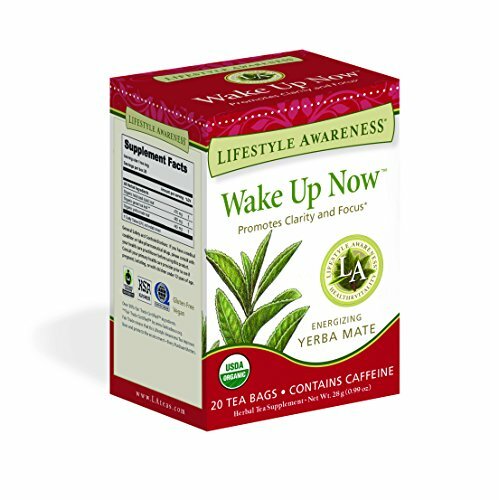 Lifestyle Awareness Wake Up Now™ Tea is formulated to create an optimum sense of inner calm and energizing focus. Enlivening and balancing tulsi- holy basil helps your body adapt to life’s stressors. Inspiring and energizing yerba mate and life-enhancing green tea will help you find clear focus any time of day. This delightful herbal combination is delicious served with milk or dairy alternatives and as a coffee substitute. Wake Up Now Tea contains caffeine for a subtle energy boost. Lifestyle Awareness Teas use organic herbs from around the world to provide natural solutions to support your wellbeing. From your very first taste of Lifestyle Awareness Teas, we know that you’ll enjoy our carefully formulated blends of delicious herbs and uplifting spices. Sip and be well! *THIS STATEMENT HAS NOT BEEN EVALUATED BY THE FDA. THIS PRODUCT IS NOT INTENDED TO TREAT, CURE OR PREVENT ANY DISEASE. If you have any questions about this product by Lifestyle Awareness, contact us by completing and submitting the form below. If you are looking for a specif part number, please include it with your message.